Brechfa Forest at Brechfa Forest (NRW)0300 065 3000work Forest or WoodlandUp to the early Middle Ages the areas north of the river Cothi were heavily wooded, forming the Forest of Glyncothi, vital to the defence and independence of the Welsh principality of Deheubarth. Following the final defeat of Wales by Edward I in 1283, Glyncothi became a Royal Forest administered under the harsh Forest Law. Forest Law involved severe punishment for offences against both 'venison' and 'vert'. The 'vert' included trees, coppices, the underwood and feeding ground of the game. Venison covered all the forest animals - in medieval Glyncothi these included red deer, fallow deer and roe deer, wild boars, wolf, fox, hare and pine marten. Forest Law was finally abolished in 1640, with most of the ancient oakwoods felled and cleared by the 17th century. As well as playing its part in the industrial revolution, timber was taken from the forest during the First World War to produce naphtha for use in making explosives. Today a very different forest has returned. The heavy use of timber in the First World War resulted in the creation of state forests and the Forestry Commission. Today Brechfa Forest covers some 6500 hectares and is looked after by Natural Resources Wales for the benefit of people, wildlife and timber production. 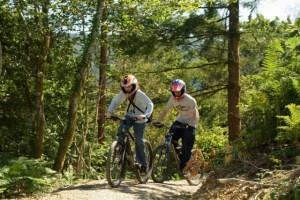 There are walking and mountain bike trails for you to enjoy, with horseriders welcome on forest roads. Up to the early Middle Ages the areas north of the river Cothi were heavily wooded, forming the Forest of Glyncothi, vital to the defence and independence of the Welsh principality of Deheubarth.